Watch Freeview TV with great resolution 1080p with the August DVB415. 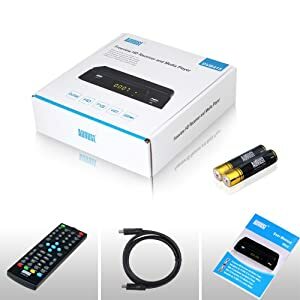 This Freeview receiver and recorder is simple to connect and thanks to its HDMI, it gives you stunning HD TV pictures with no monthly subscription. Enjoy the highest sound purity and quality through Coaxial Digital Output, connect straight to your sound bar or home stereo system. With a 7 Day EPG, you can swiftly browse through television listings for the next weeks programming. Easily set up scheduled recording and auto-channel changing so you don't miss your favourite shows. For streamlined browsing, channels can be stored in easy to find categories giving you quick access to your favourite channels. The DVB415 can also pause and rewind live TV using its timeshift function and its inbuilt multimedia player allows you to watch your digital videos, photos and music on your living room and camper van TV. HDMI / SCART - Audio Output: HDMI /SCART /Coaxial. Video output can be via HDMI or SCART, so almost any TV can benefit from the feature packed DVB415.